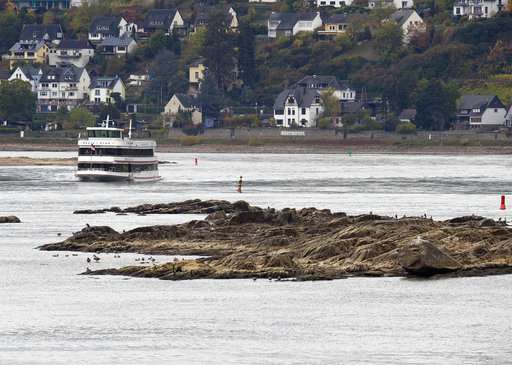 A new island in Lake Constance. A river in Berlin flowing backward. Dead fish on the banks of lakes and ponds. 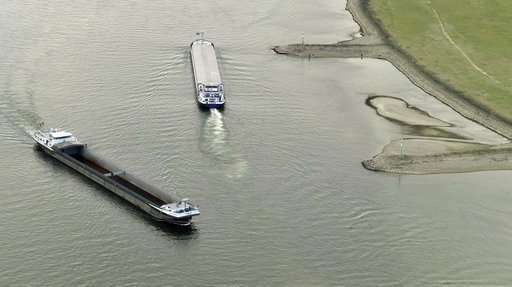 Barges barely loaded so they don't run aground. 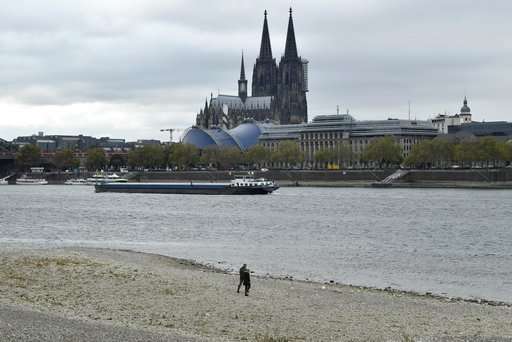 A hot, dry summer has left German rivers and lakes at record low water levels, causing chaos for the inland shipping industry, environmental damage and billions of euros (dollars) in losses—a scenario that experts warn could portend the future as global temperatures rise. The drought-like conditions have hit nearly 90 percent of the country this year. 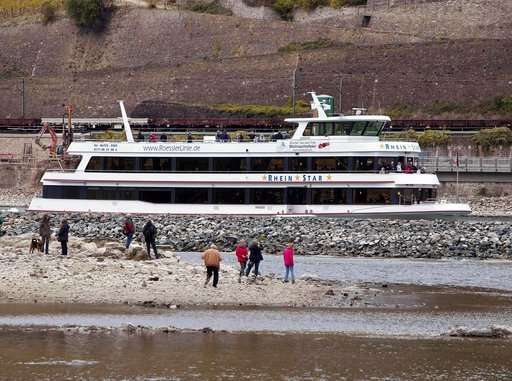 In Magdeburg, the Elbe River has been so low that no ships carrying goods south to Leipzig or on to the Czech Republic have been able to pass through since the end of June, said Hartmut Rhein of the city's waterways and shipping department. The river's down to a depth of about 50 centimeters (less than 20 inches) there, when at least double that level is needed for normal shipping traffic, he said. "At the moment the only possibility is to completely unload ships and transfer their cargoes to other means of transportation," he said. The situation is similar across Germany. 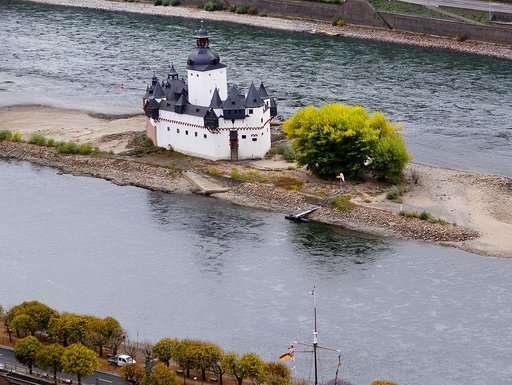 The mighty Rhine has hit its lowest water levels ever at several points, and other major rivers like the Danube, the Weser and the Main are all far below normal. On the waterways that are still navigable, the lower water levels have actually led to increased shipping traffic, as companies pack less weight onto boats so they don't ride so low in the water. That means they must send more vessels out to carry the same amount of freight. 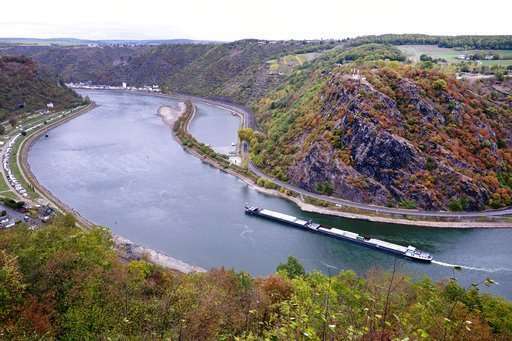 "All the ships on the Rhine are going around the clock to transport goods that would normally be on fewer ships," said Rolf Nagelschmidt of Cologne's waterways and shipping office. "At the moment, everything that can float is being loaded up." That has sent freight prices skyrocketing, and some costs are already being felt by consumers, with higher prices at gas pumps and for home heating oil. Chemical giant BASF has been forced to cut production due to a lack of transportation. 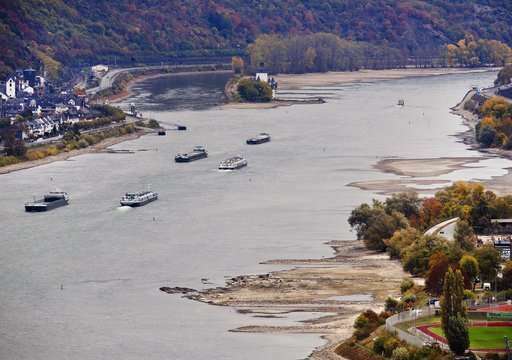 On Friday the company lowered its yearly profit forecast after a slowdown in the third quarter partly from the extra costs incurred due to the low levels of the Rhine, which flows past its headquarters in Ludwigshafen. Germany's Economy Ministry said Friday it had taken the unusual step of authorizing temporary access to Germany's strategic fuel reserves in areas where supplies have not been able to get through due to the shallow waters. 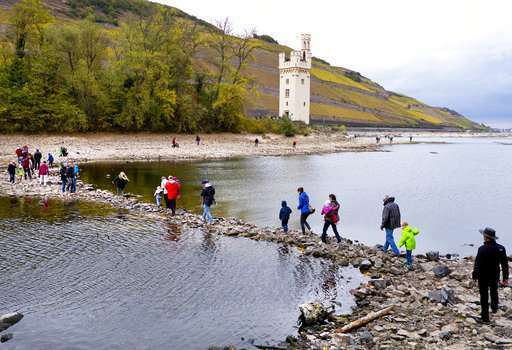 With such widespread drought, Germany's agricultural industry is also struggling. There have been shortages of feed for livestock and the country's grain harvest is forecast to drop to 36 million tons this year compared to an average of 47.9 million tons over the last five years, according to the Center for Disaster Management at the Karlsruhe Institute of Technology. "If you look at the overall economic effects, we're talking certainly in the double-digit billions," said the center's Michael Kunz. Northern and eastern Germany saw their warmest summer ever recorded in 2018, and central Germany had its lowest rainfall ever, according to the German Weather Service, or DWD. "Climate change means not only an increase in average temperatures, but also in the increase of extreme events," said DWD Vice President Paul Becker. "This year's summer has been exceptional with its intensive drought and prolonged heat, but we expect an increase in such extreme periods in the future." From April through August, a high-pressure zone sat over northern Europe and a low-pressure zone blanketed the south. That created a "blocking situation" that produced the unusual weather, said Freja Vamborg, a senior climate scientist with Copernicus Climate Change Service, a European Union information service. "During that whole time, most of northern Europe was warm and dry and the Mediterranean was wet," she said. Most of Germany has been right in the middle of the dry zone. While there has been some relief from the drought in the British Isles and Scandinavia, the drought is still plaguing Germany. 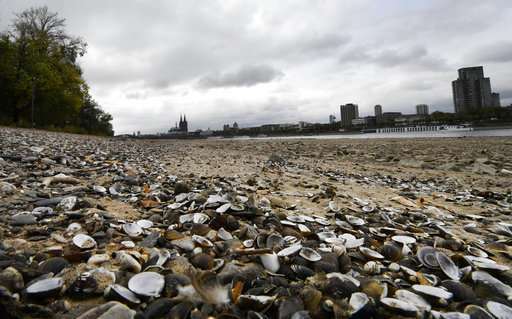 Sandbanks have appeared on the Rhine River that have not been seen before in modern history. On the Austrian part of Lake Constance, which is shared by Germany, Austria and Switzerland, a 10,000 square meter (108,000 square foot) silt island has appeared. 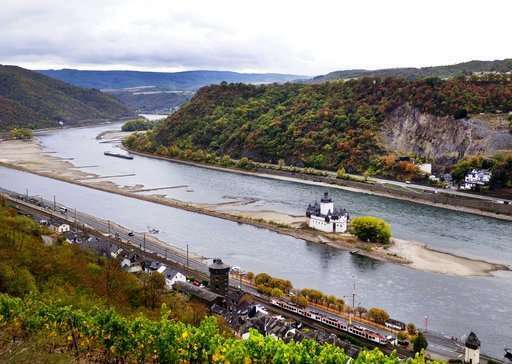 Unexploded World War II munitions are also popping up, most recently with a 1,000-kilogram (2,200-pound) American bomb being found on the exposed bottom of the Rhine near Neuwied this week. Experts say some 3,000 bombs were dropped in the area as the allies sought to destroy a railway bridge, but only a few actually hit their target. 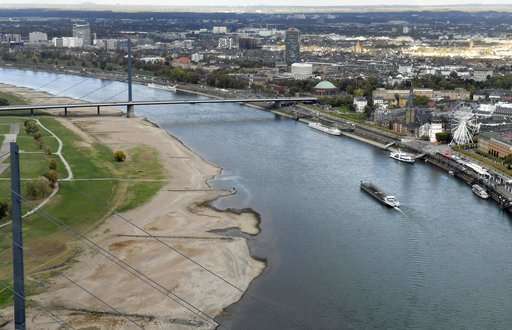 In Berlin, the Spree River, which normally flows into the Havel River in the western part of the city, has been taking water in from the Havel instead, said Derk Ehlert, with the city's environment department. "It's flowing backward, so to speak," he said. A family of beavers living in the German capital's central Tiergarten park has attracted a lot of attention for taking matters into their own paws. They built a new dam about six weeks ago to keep the area wet—but that just dried other areas up. "They wanted their old water level back," Ehlert said. Other wildlife has been less able than the beavers to cope. 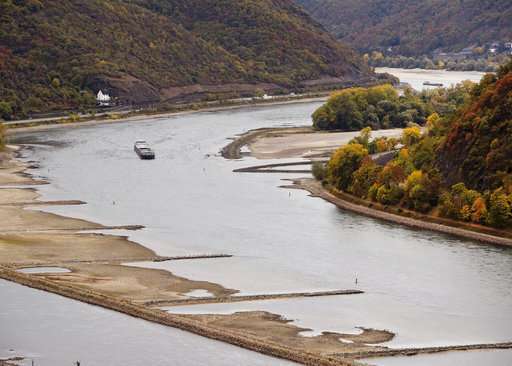 Hundreds of tons of fish and countless freshwater mussels have been dying as waters have receded, said Magnus Wessel, head of nature conservation policy for the environmental group BUND. 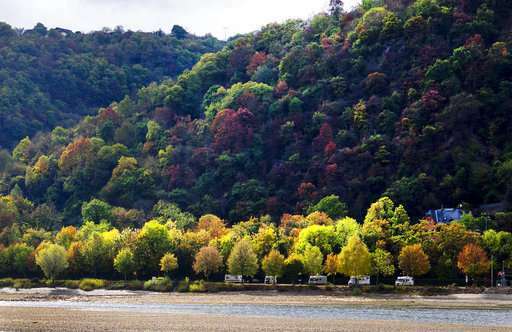 Causes for the die-offs include greater concentrations of pesticides and other toxins due to the lower volume of water, boat traffic riding closer to the riverbeds, the increased number of boats on the rivers and less oxygen in the water, Wessel said. And, of course, the obvious. "If you live underwater and you don't have water above you, you're dead," he said.